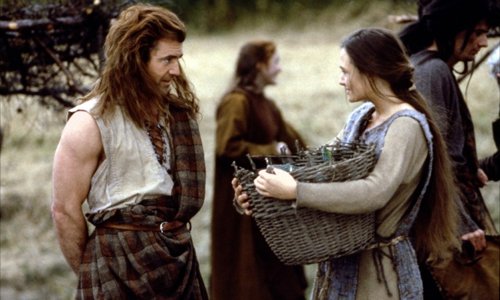 For roughly a decade and change after its initial release, Braveheart expanded outside the boundaries of its historical epic niche and into the annals of popular culture. 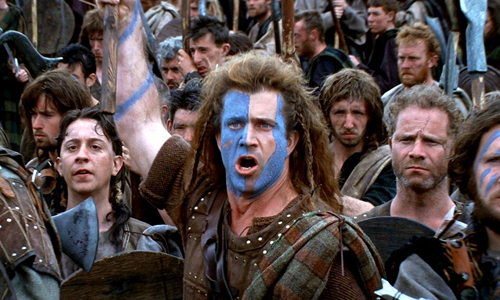 Images of characters sporting half-painted blue faces became a staple in spoofs, cartoons, and other general TV shows, while more sincere references to William Wallace's multiple proclamations about "FREEDOM!" throughout the film slipped into inspirational speeches of all sorts. This was during a rebirth for the subgenre of blockbuster historical epics, which endured such saturation during that period that both viewers and the Hollywood machine became exhausted by one after another, which led to the classic subgenre being mostly shelved until audiences seem like they're ready for it again; as of now, the desire for superhero films has filled that "more, more, more" void. What separates this one from its contemporaries can be found in Mel Gibson's craftsmanship and fierce charisma in the lead role, along with the riveting story itself of pursuing a severance from royal authoritative rule, resulting in a triumph that's more than just the inherent grandeur and wrought emotion of its peers. Braveheart depicts the struggles of freedom fighter William Wallace (Mel Gibson) during 13th century Scotland. At first, with William as a boy, we grow to embrace the Wallace family in its infancy. As the younger of two boys under their father alone, Wallace must stick around and tend to the family farm while his father and brother ride off to battle for their land. When he looks towards the horizon the day after while doing his chores to see the weathered Scots without his father and brother, he knows what's happened without being told. Strategic choices were made for the casting at this point in the film, ones that light a poetic fire underneath the story from its start. James Robinson delivers a gentle, evocative performance as the young William, projecting subdued strength underneath his sullen demeanor. He connects brilliantly with young Murron, a girl who silently brings him an impromptu gift at his family's funeral, proving to be the last moments of innocence for Wallace as his uncle, Argyle (Brian Cox), trots in following the funeral to whisk William away to a life of hardened education and training. At this point, Braveheart begins to grow into the kind of dramatic endeavor that speaks to movie lovers of all stripes. Galloping across the beautiful Scottish countryside amidst beautifully expansive cinematography from director of photography John Toll, Wallace returns to his home many years later. He begins to fix up his house, interacts with some of his family's old acquaintances, and rediscovers his young Murron (Catherine McCormick). Rapid romance doesn't sit terribly well with me with most films, but the instinctual progressions between William and Murron comes across with such warmth and candor that it overcomes those concerns. Plus, it's in every way affected by the absorbing performance from McCormack, giving us welcome reason to see where Wallace's anger will come from. She's the catalyst for the film's spirit: while the story's other objectives begin to move into place, attention falls upon how the pair of 'em build their bond as tradition, family ambition, and rebelliousness entwine into tender romance. Scotland is under oppressive control by the English under the mustache-twirling King Edward the Long Shanks. Patrick McGoohan offers an oddly provoking and unctuous performance as the King, with ample reasoning to despise him without sensing much of his strength. Through his whims and decrees, he invokes chaos and suppressed tyranny from corner to corner along his boundaries, and from the loins of their master, his henchmen carry the same offensive clout at the lower levels through his kingdom. During a ramshackle attempt from these guards to violate Murron in the main town, William provokes an act of retaliatory aggression with the local English troops. In response, she falls victim to the English repugnance, and with an impassioned man like Wallace, that kind of act would undoubtedly lead to more than just a few choice words with the lord. Thus, the gears of war and revolt begin to turn. 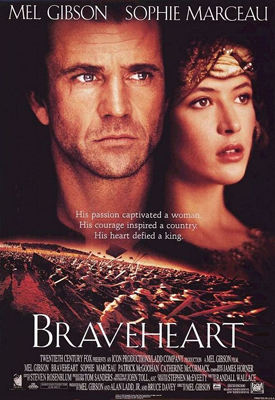 Braveheart tugs at the heartstrings and dazzles the senses with evocative images through its quaint beginnings, then grows absorbingly coarse as the epic tragedy gains momentum through its spirit of independence and chivalric resolve. William's vigor grows into a smoldering blend of vengeance and strife for Scotland's freedom from this oppression, and the viewer can see him become a physical embodiment of Scotland itself, living and breathing purely for their sovereignty and nothing else … and one effortlessly empathizes with him. His following soldiers, meticulously portrayed by a host of strong character actors led by Brendan Gleeson as Wallace's childhood friend and David O'Hara as the crazy Irish fighter, unabashedly support him, both out of respect and out of his writhing sympathy for Murron. Gibson's ruggedly charismatic performance as Wallace keeps him appearing famished and desperate - but never with wavering force. As Gibson's film thunders forward with its haunting pipe-laden score and beautifully soiled cinematography, it becomes obvious why Braveheart's tale of burgeoning freedom continues to work as well as it does, unleashing something expressive with every cinematic maneuver it pulls off. The film's epic narrative and kilt-stained visual grandeur triumphs through a poignant level of interwoven, meaningful components, forming into a brutal, tragic, and altogether breathtaking piece of work … and that's even before the film's grandiose battles. Famous for its "freedom speech" before a showdown with the English, Braveheart offers a lot of suspenseful brutality, with plenty of severed limbs and blood splattered along the emerald lawns. Yet, it's within the context aside the brutality that these battles are elevated from acts of flailing viciousness to intriguing stratagems, where, amid backstabs and trickery through the struggles between the English and the Scots, the clanking of swords becomes much more rewarding and engrossing. Alongside the narrative of tragic love and the ensuing pursuit for liberty, Braveheart also offers glimpses behind closed doors at the inner conflicts within the English camp. The former French Princess of Wales, portrayed with incredible charisma by Sophie Marceau, struggles to build a relationship with her potentially gay husband, the Prince of England. She yearns for her own freedom from the reigns of different kinds of English oppression and, in connections with William Wallace, delivers one of the few glimmers of purity and beauty through her aid towards the Scots. While full of layers and complications, Gibson brings all this to the table as straightforward, coherent, yet volatile drama until politics complicate the final act, involving Robert the Bruce (Angus McFayden) and his family's lineage. Through this, the pace methodically downshifts to a slower tempo, built for reflection while deliberately suppressing the ferocity. Braveheart never loses its grip on the vigor established at its beginning, though, merely providing a breather leading up to a gut wrenching and evocative finale that, yeah, never fails squeeze a tear out of these eyes.